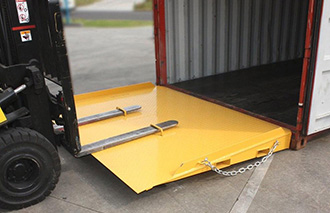 Drive your Forklift Straight into any Shipping Container! Due to OH&S regulations the UNIRAMP must not be manually loaded onto a vehicle. 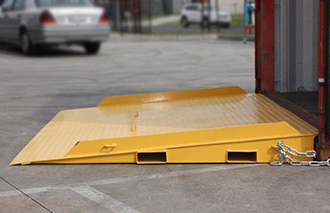 Use of forklifts or other lifting equipment is required. Side protection rails prevent accidental falls. 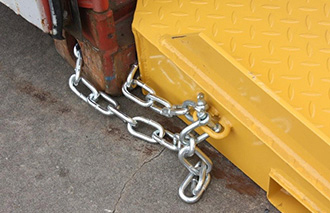 Chain to secure your ramp to the container stops unwanted movement. 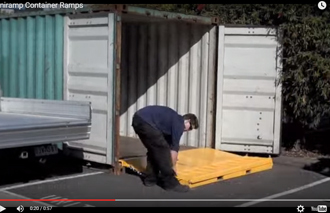 Watch how easy it is to use our container ramps. Multiple lifting points for ease of placement. 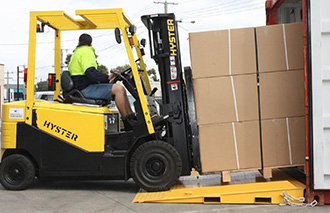 Gradual incline ensures your forklift maintains maximum tilt. Designed and constructed in accordance with Australian standard AS3990 - Mechanical Equipment - Steelwork.